Lenard Baskin was an American sculptor, book-illustrator, wood-engraver, printmaker, graphic artist, writer and teacher. While he was a student at Yale University, he founded Gehenna Press, a small private press specializing in fine book production. 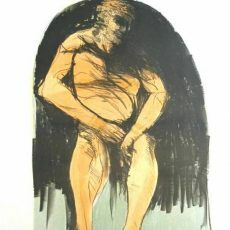 From 1953 until 1974, he taught printmaking and sculpture at Smith College in Northampton, Massachusetts. Subsequently Baskin also taught at Hampshire College in Amherst, Massachusetts. He lived most of his life in the U.S., but spent nine years in Devon at Lurley Manor, Lurley, near Tiverton, close to his friend Ted Hughes, for whom he illustrated Crow. Sylvia Plath dedicated "Sculptor" to Leonard Baskin. It was the penultimate poem in The Colossus (1960). His public commissions include a bas relief for the Franklin Delano Roosevelt Memorial and a bronze statue of a seated figure, erected in 1994 for the Holocaust Memorial in Ann Arbor, MI. His works are owned by many major museums including the Metropolitan Museum of Art, the Museum of Fine Arts, Boston, the Museum of Modern Art, the Art Institute of Chicago, the Boca Raton Museum of Art, the British Museum, the Honolulu Academy of Arts and the Vatican Museums. The archive of his work at the Gehenna Press was acquired by the Bodleian Library at Oxford, England, in 2009. In 1966 he was featured in the documentary, "Images of Leonard Baskin" by American filmmaker Warren Forma. Leonard Baskin was a first cousin of American modern dancer and choreographer, Sophie Maslow. He died on June 3, 2000 at the age of 77. The Art Institute of Portland has a memorial to him.